As we age are joints do jot heal and repair as efficiently as when we were younger. Weightlifting and bodybuilding can place excessive loads on the joints due to repetitive motion, heavy weight, lack of flexibility, improper form and not warming up properly. Avid weightlifters and bodybuilders who sustain joint injuries are hampered as often they find taking time off from training to heal properly may result in loss of hard gained muscle. Treatment strategies which may expedite recovery, promote healing and regeneration are sought after to allow minimal time away from the gym. 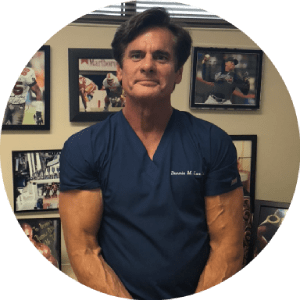 Platelet Rich Plasma (PRP) and Stem Cell Therapy may be viable treatment options for these athletes. Platelet Rich Plasma (PRP) incorporates spinning the patients blood in a centrifuge and concentrating the bloods platelets to deliver an abundant supply of healing growth factors to the injured joint. PRP has been used by many elite athletes in a variety of sports to enhance recovery and repair especially the knee joint. This treatment with PRP has also been used as an alternative to joint surgery for many athletes including knee, hip, and shoulder problems. Stem Cell Therapy is a more complex treatment in it’s healing response. Not only does stem cell treatment use the bodies growth factors found in the PRP, the stem cells can direct other cells to participate in the recovery and regeneration process. The stem cells are powerful master control signalers, directing communication between cells and actually migrating or homing towards injured cells. Aging weight lifters and bodybuilders, are no less enthusiastic about their sport and discipline. However years of repetitive strain, prior injury (or trauma), or genetics may have lead to the development of joint arthritis. Shoulder and knee degenerative or osteoarthritis are common problems in older lifters. Arthritis medications (anti-inflammatories) may alleviate pain short term, but do not alter the degenerative cascade pathway. Thus the more lifting in a worn arthritic joint, the more progression of the arthritis. Not a conducive scenario for maintaining that sport and feeling no joint pain. continued weightlifting, is to use regenerative therapies Platelet Rich Plasma or Stem Cell Therapy to repair, diminish joint inflammation and retard the progression of degeneration. It is possible to modulate the local cell inflammatory mediators through the use of these regenerative therapies and stay active in the gym lifting weights and maintaining a bodybuilding philosophy why protecting and repairing your joints.